The Gümmi Pillow is one of the three pillows made and sold by Berkeley Ergonomics (the others are the Plein Air Latex Pillow and the Organic Wool Pillow). Like many of the best-selling pillows, the Gümmi is filled with shredded latex. 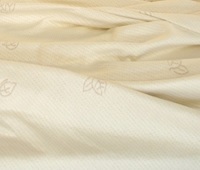 The odd angles and corners of the pieces of latex (from trimming latex layers for mattresses) hold them in place, so the pillow maintains its shape. One stated advantage of this pillow is the absence of ear pressure. Gümmi is a name for India rubber, and it refers to the 100% natural Talalay latex in the pillow, made from rubber tree sap. Latex is very resilient (remember it is rubber), and it is anti-microbial and anti-fungal. A shredded foam pillow is very breathable, accounting for its popularity. Talalay latex is also hypoallergenic. The Gümmi Pillow comes in a zippered cover of organic cotton. This knit cover can be machine washed and tumble dried. This pillow is available in stores selling Berkeley Ergonomics products in Standard or Queen size. It is more affordable than the Plein Air Latex Pillow. The warranty is not stated. It is Oeko-Tex 100 certified as free from harmful chemicals.